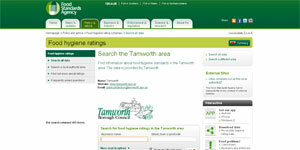 Find out if local food businesses have a good hygiene rating. The scheme is run by Tamworth Borough Council in partnership with the Food Standards Agency (FSA) as part of their national scheme. Its aim is to provide you with at-a-glance information about hygiene standards in food businesses, so you can make an informed choice about where to buy and eat food. 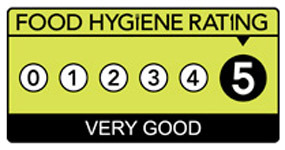 We rate the hygiene standards found at the time of inspection on a scale from '0' (urgent improvement required) to '5' (hygiene standards are very good. The rating shows how well the business does overall. A business may do better in some areas than in others - the rating is designed to take this into account, including the areas that need the most improvement. The rating is not a guide to the quality or value of the food the business prepares or sells. The Food Standards Agency publishes food hygiene ratings on its website where you can search for local businesses. Please note that the ratings are based on standards at the time of inspection and the business may have made changes since then. The food hygiene rating scheme is not an endorsement of current standards but reflects the rating we awarded at the time of the last inspection. It may also take up to 28 days for the new rating to appear on the website after an inspection.